If you’re remodeling your current house, building a new house, or planning a move and shopping the housing market, there is a good chance you will experience (or already are experiencing) an overwhelming amount of decisions. With all the decisions that come with our homes, it can often be easy to overlook ones that are more important than most people realize, like the decisions that come with garages. Today, garages have become pretty standard with most houses as they bring many benefits, including the protection of your vehicles. If homeowners don’t have a garage, they may still be debating whether to add one to their current home or start shopping for a new home that has one. However, when it comes to garages, most people do not think about whether or not they prefer an attached or detached garage. Both detached and attached garages come with an extensive list of advantages and disadvantages, and ultimately neither is worse than the other, it is solely based on personal preference and what priorities are most important to you. Since you most likely have never really thought about which type of garage you prefer, we are going to help you by highlighting the unique features that each option offers, starting with attached garages. Easier to build. If you’re adding an attached garage to your home and are starting from scratch, they are much simpler and cost-effective project. Think about it: you already have one, if not two walls that will make up half of the garages framework. Compared to a detached garage, an attached garage will most likely take less time and cost a bit less. Easy access. This may be a given, but attached garages are much more simple to access than a detached garage. It’s more convenient and time-efficient, as you can easily go back and forth between the garage and the house. Easy access becomes an important factor, especially if you choose to keep an extra fridge in the garage or use it as an extra workspace. Having this type of accessibility can be extremely convenient for homeowners. No more walking through weather. An attached garage can be a real luxury, especially during the harsh Midwest winters. Whether it is snowing, raining, or there are high winds, there’s nothing more beneficial than being able to access your garage without having to go outside. During these terrible weather conditions, attached garages give you the advantage of being able to park your car safely and access your home without being exposed to the conditions outside. Allows more yard space. Unlike detached garages, attached garages do not take up as much open yard space. If you have children or pets, this can be a huge advantage as it allows for more space to play. Also, the yard space that is saved from having an attached garage can be used for a garden, swimming pool, fire-pit, trampoline — there are plenty of options! Visually large appearance. In a previous blog, we covered how garages can increase your home’s curb appeal, but attached garages can also make your home appear larger. If you’re someone who has a small home and are interested in making it appear larger than it actually is, an attached garage can do just that. Sometimes, depending on the size of your home and garage, an attached garage can appear to double the size of a house. Cheaper utilities. Since you have utilities already set up in your home, it will be much simpler and cheaper to extend them into your garage if it is attached. The same goes for electricity, too. Higher security risk. 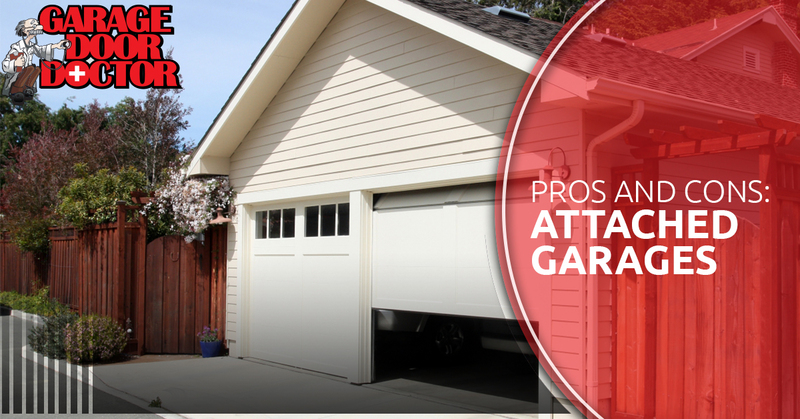 Although this is often overlooked, attached garages bring slightly less protection and security than a detached garage does. This is simply because if a trespasser can access the garage, it is much easier to gain access into the house it is connected to, which is not possible with detached garages. However, there are plenty of ways to help prevent and protect your garage from theft. Difficult to build in certain neighborhoods. Some neighborhoods feature houses that are built closer together, usually offering a more narrow backyard space. If you live in these types of neighborhoods or live on a small lot, there may not be enough space to add a garage to your home. Many smaller lots with long and narrow houses are better off building a detached garage instead. Less privacy. This is more based on personal preference, in addition to what you use your garage for. Some homeowners utilize garage space based on personal lifestyle, needs, and preference. If you solely use your garage for car storage and parking, then this really isn’t something that you should worry about. However, if you use your garage space for an office, gym, or getaway from the main house, it is easier for family members to pop-in and causes distractions. May look odd on older houses. As we mentioned earlier, attached garages didn’t take off until the 1950s. Since older homes weren’t designed or built to have a garage, it can often be difficult to add one. If you do add a garage to an older home, it may look odd and visually unappealing. As you can see, there are plenty of pros and cons to attached garages. Keep an eye out for our next blog, as we will cover the advantages and disadvantages of detached garages to help you decide which is best for your home. Whether you choose an attached garage or not, you’re going to need a high-quality garage door as well as a professional garage door installation company to complete your garage. If you live in Indianapolis, or in the surrounding areas, you can count on Garage Door Doctor for all your garage door repair and installation needs! 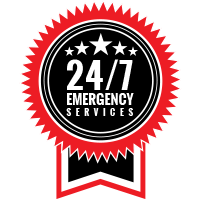 Garage Door Doctor offers 24/7 emergency service, so they’re always ready to help their customers. 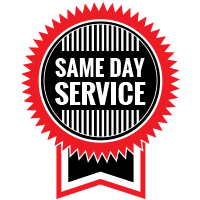 For more information or receive a free estimate, contact the team at Garage Door Doctor!